When you are in Puerto Ayora you’ll have many recreational activities available to you, they include organized tours, scuba, surfing, kayaking, trekking, biking, snorkeling, bird watching, etc…. (Duration: depending on island visited generally all day). 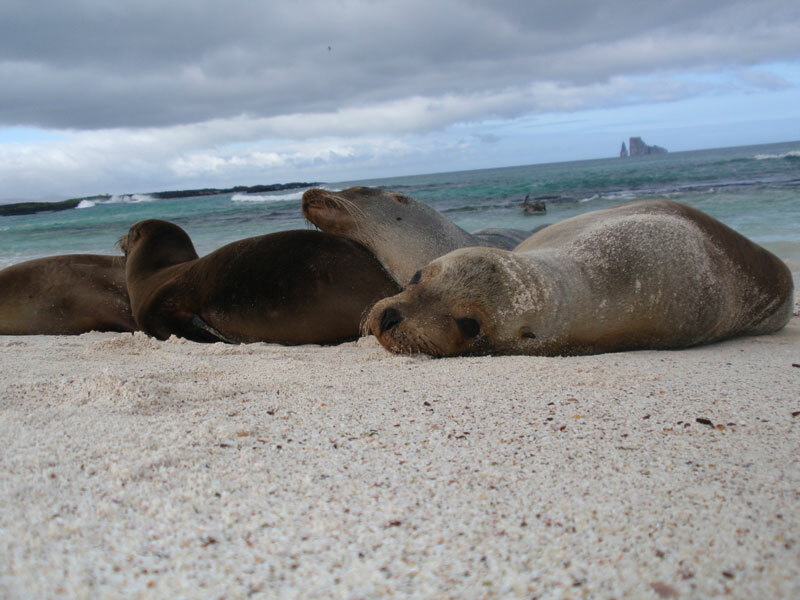 Day tours are organized and are managed by local operators; they include a Galapagos National Park (GNP) certified naturalist guide, as well as snacks on board. Islands available on day tours are: Bartholomew, North Seymour, South Plazas, Barrington (Santa Fe), Floreana and Isabela (usually 2 days for this one). It is necessary to make reservations in advance, with a tourist agency, since space is limited in order to secure availability. The cost for these tours varies around USD$140 per person. (Duration: approx. half to all day, depending on site visited). 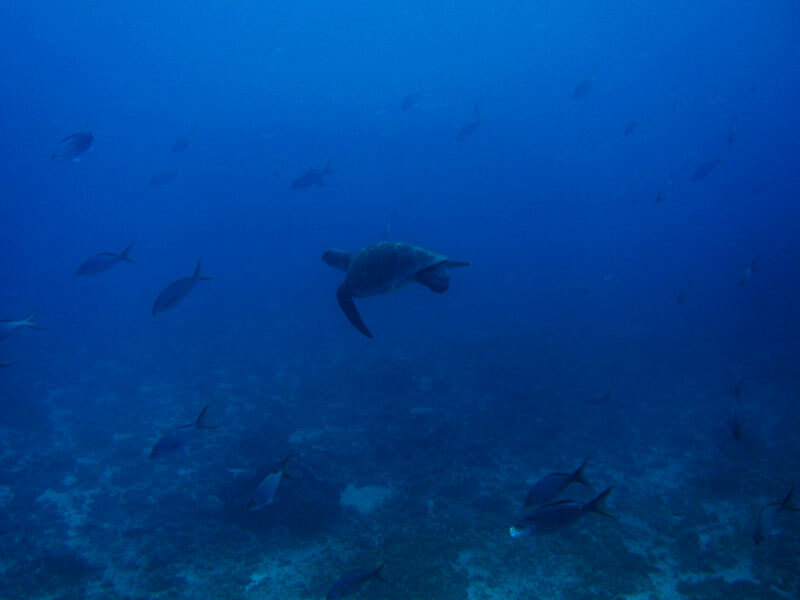 If you wish to explore the wonders of the underwater world, Galapagos is one of the top places to scuba dive in the world. There are many operators that leave from Puerto Ayora on a daily basis. 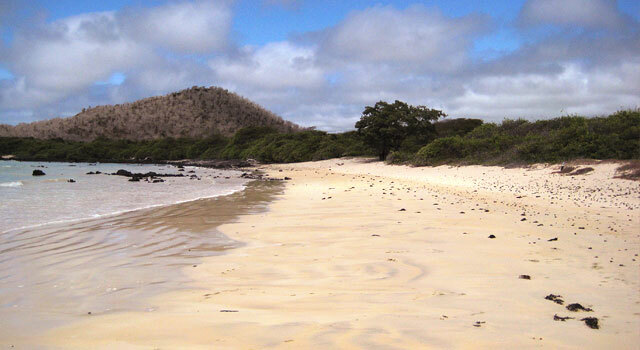 Islands and Sites that you can visit include: Santa Cruz island (Pta. Estrada, La Loberia, Loberia bank), Santa Fe island, Bartholomew island, Cousin Rock, Mosquera Island, North Seymour island, Daphne minor island, Beagle Rocks, Bainbridge Rocks, Guy Fawkes Rocks, Floreana Island (Enderby island, Champion island, Devils crown), and of Course Gordon Rocks. Dives usually last all day and involve 2 dives. The cost depends on the dive site and the operator but usually varies between USD$ 130 -180. Beautiful Beaches (one with surf and one with out), of fine white coralline sand. Located 2 and ½ km from town. It takes 45min. to walk to the beach on a paved cobblestone path. The path takes you through a typical dry zone forest of Incense trees, Matazarno (ironwood) and opuntia cacti trees. You can see various species of finches, including cactus, vegetarian, all the ground finches, warbler finches, and sometimes the odd tree finch. Also there will be Galapagos Mocking birds, yellow warblers, and Galapagos Fly catchers. The beach offers you surfing opportunities, sightings of costal birds and swimming (although you must be careful of strong currents and undertows in the first beach). At the calm beach (located past the first beach on the other side of a small isthmus), you can swim in peaceful waters as well as snorkel with sea turtles, or do kayaking (kayaks are rented at the beach). (duration apprx. 3 hours): this excursion will take you to the top of Santa Cruz island to an inactive volcanic peak. You can take a bicycle up to the park boundary and then continue on foot. 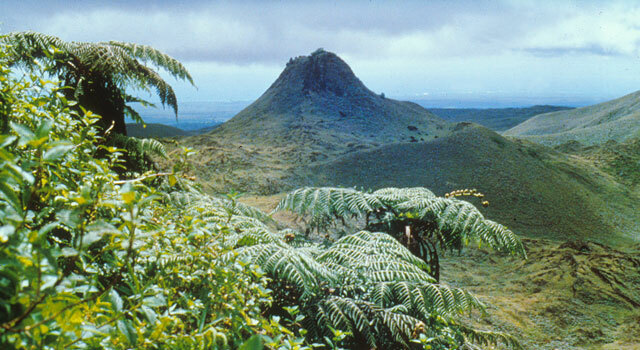 You will pass through the islands humid vegetation zone, past endemic miconia bushes and then through extensive fern areas. This is the habitat of a bird rarely seen by visitors, the Galapagos Rail (pachay), that hides under the ferns and other low vegetation. It is also possible to see the short eared owl, on of the 3 species of raptors in the Galapagos. Once on top of Needle Peak you will have a spectacular view of the north, west and south side of Santa Cruz Island, and if visibility is good you can see most of the islands of the Galapagos archipelago from there. (duration 2-3 hours) in a taxi or bicycle. 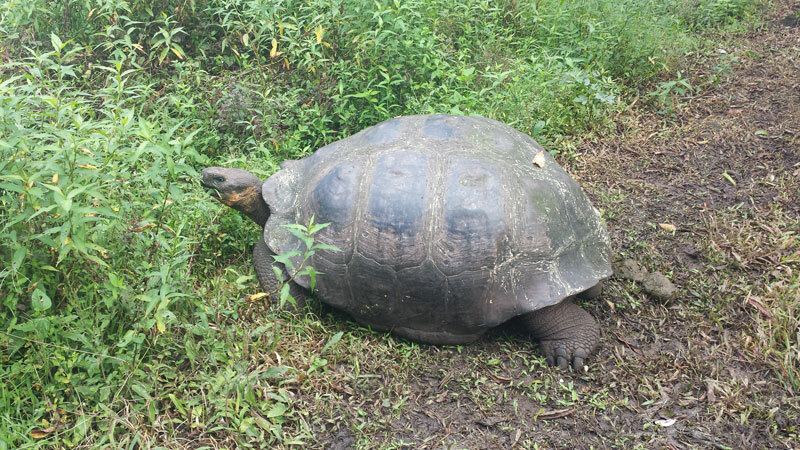 The emblematic Giant tortoises, for which the islands are known worldwide, are found grazing in perfect tranquility. 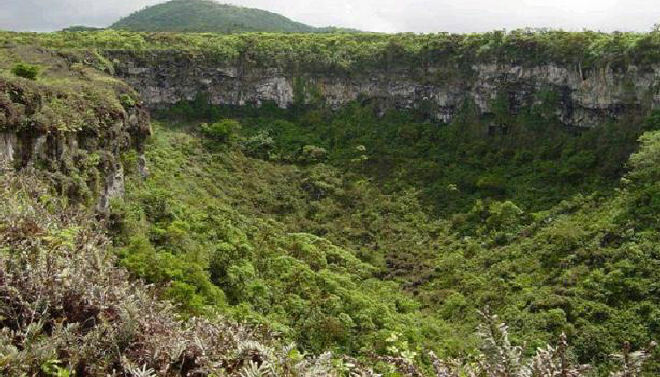 During this visit it is also possible to get to know the lava tubes and walk through them. Cost varies; the entrance to the tortoise grounds is $3 USD. (sink holes) aprrox. 1 hour. In a taxi or bicycle. You can include this visit to the one to the tortoise reserve. The twins are two volcanic radial fissure craters formed by a collapse of the roof. Around the craters is a scalecia forest canopy of “Lechosos” (Scalecia trees); it is a good site to see native plants, tree finches, carpenter finches, and the surprisingly brilliant Vermillion Fly Catcher. (Duration 2-5 hours: in taxi or Bicycle. A beautiful beach with an area to camp and make bonfires; located on the east side of Santa Cruz. 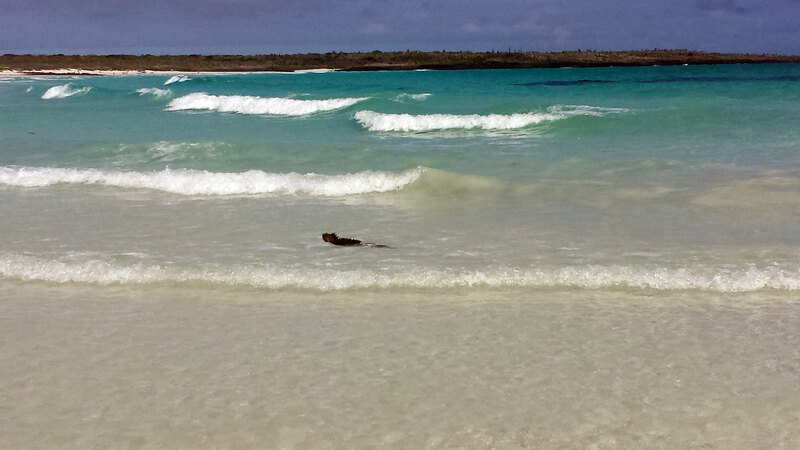 One can swim, snorkel , view birdlife (sometimes flamingos are seen feeding in the lagoon behind the beach). This beach has toilets and showers for the comfort of visitors. Visiting by bicycle is excellent since you have spectacular scenic views, you go through various vegetation zones and on the way over it is all downhill so you let gravity do all of the work. Returning on bicycle is very good for those that enjoy a workout since half of the distance to town is uphill. (La Grietas) 30 min. away from on foot from “La Peregrina”. 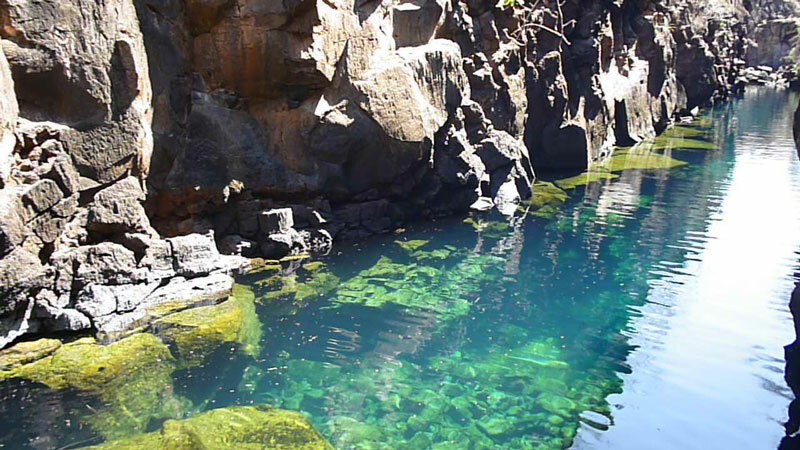 This is a very neat swimming hole, formed by the collapse of the academy bay (Puerto ayora) ground slab several thousand years ago. In order to get there a water taxi must be taken across the bay to “the other side” or barrio Estrada (Estrada neighborhood), and from there a 10 minute walk will be enough to reach “las Grietas”. The trail takes one to the top of the crack, where a panoramic view of the water hole down bellow is possible. To reach the bottom, the water level area, one must walk down a pair of wooden stairs and then walk thru the boulders left by the collapse. It is very common to find locals climbing and jumping off the cliff walls into cool crystal clear water (water depth is about 8m.). This is a great place to swim. It is also possible to snorkel at this place and observe large yellow tailed mullets and parrot fish.